NCS Fluid Handling Systems offering best in class service and support to contractors and municipalities. Join NCS Fluid Handling Systems for a rewarding Career as a valued employee. New opportunities in the all service areas that the NCS Fluid Handling Systems business units operate in British Columbia, Alberta, Saskatchewan, Manitoba and Southern Ontario in Spring 2019. New Branches in Calgary, Winnipeg and the Lower Mainland BC are opening and positions in all areas of management and technical operations available. Vancouver and Lower Mainland, BC Service and Products Representative. NCS Fluid Handling Systems Inc is looking for sales and service representative with knowledge and experience in the areas of Fluid Handling, Industrial Water Management / Services and Construction site services for dewatering etc. Self starters and individuals with a current understanding of the local water pumping and water management services while be given first consideration as well as related experienced in pump operations and onsite construction support requirements such as dewatering and filtration. NCS Fluid Handling Systems team is an interactive solutions-based group that is willing to engage and train the right people and start you on your way to a rewarding career in this rapidly growing specialty business. NCS Fluid Handling Systems is now taking resumes and hiring all levels of experience of technicians. The best candidate is a self-starter Field service technician that can work in a team environment, able to travel to work on our site projects and deliver the desired best in class customer service experience. The goal is to drive service success that improves Customer satisfaction, Quality of services, , Safe work practices and Maximizes customer retention. Familiarity with Piping and Water Pumping systems an asset. Able to pass pre-access drug and alcohol screening for safety sensitive sites. NCS performs hydro-static testing services on all sizes and types of atmospherically operated storage tanks both in newly-built applications and API-653 re-certification of existing storage tanks. 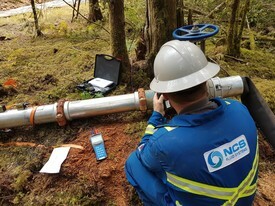 NCS performs all test services covering the entire spectrum, from the sourcing of any crossing agreements on public and private land, diversion licensing from applicable regulatory bodies, permanent or temporary water pumping systems, particulate filtration, water sampling and code-specific functional testing of the storage tank completed to applicable construction code or standard. The final step in our services is to supply a professionally assembled turn over package with detailed information required for the applicable regulatory body or utility commission granting the fit for service authorization. Our municipal projects install temporary works with the environmental consultant, and offer a comprehensive dewatering package that includes a dewatering plan, equipment specification, recommendation, filtration and groundwater monitoring. Correct installation of wellpoint/sandpoint equipment and monitoring of the dewatering process leads to higher system efficiency and cost savings. We are proud of the NCS Fluid Handling Systems team we have and consider them to be some of the highest skilled and trained technicians in the market. NCS Fluid Handling Systems is growing the team of skilled technicians and project managers to continue to support and serve Canada in the API storage tank and pipeline hydro-static testing market as well our Municipal markets. NCS Fluid Handling Systems provides sewer bypass, sand / well pointing systems, site water management services and Water filtration for particulate and hydrocarbon removal. Many of the NCS Fluid Handling Systems projects require physical labour and are located in various cities or sites across Canada, so the ability to travel is required. NCS Fluid Handling Systems provides both on-the-job and in-class training in all areas of quality, safety and operational excellence. If you wish to start a career with NCS Fluid Handling Systems, please attach your resume and our human resources department will contact you.